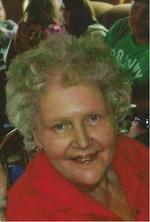 Norma Jean Regal age 80, of Ashland, died Thursday April 26, 2012 at her residence. She was born in Mt. Vernon, Ohio on January 18, 1932, the daughter of Lewis Charles and Mary Mildred (Smith) Scott. Mrs. Regal was a 1950 Graduate of Ashland High School. She had lived most all of her life in Ashland County. She had been employed with the Eagle Rubber Co., the T & A Grocery and most recently she had worked in the Bakery at Hawkins Market for 18 years. Mrs. Regal attended the East Gate Bible Church in Ashland. She enjoyed camping and yard sales. On October 1, 1957 Norma married Rollin Regal who survives. Other survivors include her two daughters and son in-law, Vicki and Donald Kostecki of Spencer, Tami Jo Miller and Fiancée Greg Tester of Jeromesville; her son, Kevin Regal of Ashland; four grandchildren; six great grandchildren; brother, Dennis Scott of Georgia; along with her sister and brother in-law, Becky and Sam Gray of California. She was preceded in death by her parents and two brothers, Richard Scott and Larry Scott. Funeral Services will be held at the Heyl Funeral Home on Tuesday May 1, 2012 at 11:00 A.M. with Pastor Nathan Wells officiating. Burial will follow at the Huntington Center Cemetery in Huntington, Ohio. Friends may visit with the family one hour prior to the service at the funeral home. The family suggests memorial contributions may be made to Hospice of North Central Ohio 1050 Dauch Dr. Ashland, Ohio 44805.